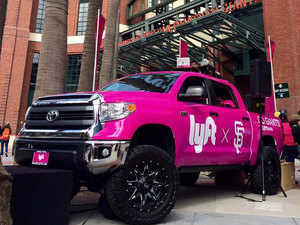 Lyft Inc. closed its second day of trading 4.2 percent below its $72 public offering price, an ominous sign for the stampede of unicorn companies planning to follow the ride-hailing business to the stock markets this year. 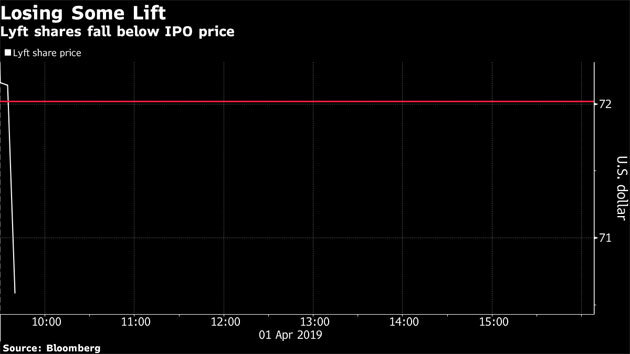 The IPO has become a test case, not just for rival Uber Technologies Inc., but for a glut of highly valued startups like Pinterest Inc., Postmates Inc. and Slack Technologies Inc. that have signaled plans to list this year. Slack has selected the New York Stock Exchange for a planned direct listing this summer, a person familiar with the matter told Bloomberg. Getting Wall Street hyped for an IPO is a practiced science, but managing expectations after a public offering is a game of market psychology that Lyft and its underwriters saw turn against them on Monday, said David Erickson, a finance professor at the University of Pennsylvania’s Wharton School. Lyft worked hard to drum up that excitement ahead of last week’s offering. It told prospective investors on the second day of a well-attended road show that the deal was oversubscribed. It raised price expectations from a range of $62 to $68 a share, finally opting for $72. On Friday, the shares opened on the Nasdaq Global Select Market at about $87 — 21 percent above the IPO price. By the close of trading that day, the price was down to $78. On Monday Lyft fell as low as $67.78 before closing trading at $69.01. The Nasdaq closed the day up 1.3 percent. You can’t read too much into the first days of trading. It took Snap Inc. four months to dip beneath its 2017 IPO price, and at $11.36 on Monday it’s still below that the $17 a share offer price. Facebook Inc. dropped below its IPO price on the second day of trading and had a rocky first year on the market before the stock took off. Lyft worked with JPMorgan Chase & Co., which led the offering with Credit Suisse Group AG and Jefferies Financial Group Inc. The San Francisco-based company reserved a pocket of shares, called a greenshoe, for bankers to help stabilize — and sometimes defend — the IPO price. “It’s going to be a struggle today for the underwriters to keep it around the IPO price,” said Erickson, a former co-head of global equity capital markets at Barclays Plc. Lyft is a model of the unicorn class of companies that secured valuations in excess of $1 billion from private investors and will soon seek validation from the public. These are high-growth companies, with even higher propensities to burn through capital, and they’re built around compelling narratives of world-altering potential. Lyft has said it can fundamentally alter transportation and eventually usher in a world of self-driving cars. The same can be said of Uber, which is expected to publicly file paperwork for its own IPO this month. Slack makes similar promises of reinventing how workers communicate and Postmates regarding how people shop for food and other goods. A story that doesn’t pan out can lead to losses, as meal kit delivery company Blue Apron Holdings Inc. Its shares have fallen about 90 percent from the initial price to 99 cents on Monday.